Some of you maybe wondering why I don’t write much on here.. Does she not have anything to say? Does she just not like writing and expressing herself? It’s 2:31 AM …. I have a sleeping toddler in the same room I do all my computer work on and even the slightest clicking of the keyboard wakes her up in an instant! So what I am trying to say is, if I don’t say much or have horrible punctuation don’t get too upset with me! Please keep encouraging me with your comments.. Thank you guys that do leave them!!!!!!! I hope you all enjoy these pretty Buttons! Beautiful buttons, Keren. Do you have a download link for your newest creations? I always appreciate your hard work. I also hope you get some much-needed sleep. I don't get many comments either! It's a good thing I don't blog solely for comments, right? Or else, I would have quit long ago. I really appreciate your blog and I especially love the Bible verses. Super Cute! I co-sleep with a two and almost 5 year old.. So I get it! I think you do the perfect amount.. I have actually cut my blogging back to every other day… it is just a hobby for me but was taking over. Thank you so much for ALL of your posts. I love the images you create. You do AMAZING work and I truly appreciate all that you share! Thank you for doing so! Fairly new to your blog and I don't comment much cause I do alot of gardening and yard work which is a full time job caring for my irises and daylilies along with all my roses but I do appreciate all you do for us and I pop in when I have a few minutes to spare. Thank U 4 the beautiful pastel frames. OOOh, this is so lovely! Thanks!! God Bless You. Doing you do all you do with a toddler sure makes you a super woman. You are much appreciated. Kiss that baby's sweet face for me. Hey! I know everything about toddlers waking up at the slightest little noice… It's been years ago for me, but I still remember and I understand you completely! I wonder how you get any computering doen at all in fact… but then when my teenagers where toddlers we didn't have a computer yet, so I wouldn't know how that would be. 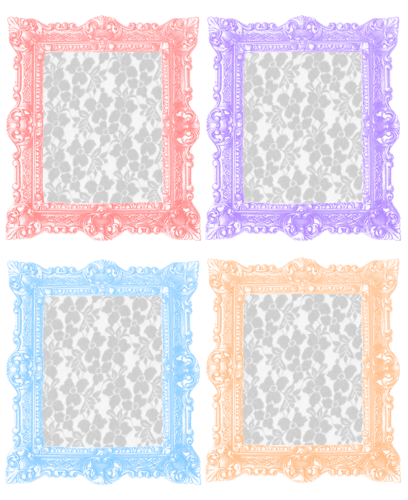 Beautiful job on the frames you made! They are gorgeous. Thanks! Aww Keren that Is Hard to do when You have something to say! I hope that you get more comments!! I am going to make a point to comment here as much as possible!! I love your blog and all the Pretty things you share with us!! You Inspired me so much with your Fabric Flower Garland That I made one of my own! It is so Fun to make..The only thing I did different was I used My Cricut Cutting Machine to cut out the flowers and leaves!! Keep those garland tutorials comming!!! Beautiful! I may be using them. Thanks! And this blog/website is awesome — I think so many bloggers out there take it for granted — including me! I know what you mean, Keren… Know the feeling of the "missing comments". You're a very generous blogger who really deserves lots of comments and appreciation for everything you're giving your visitors/followers! I tried to post earlier and it wouldnt work but I love all the wonderful things you make and appreciate all the great verses you post! Thanks for the pretty frames Keren…and all that you do! Aww, I totally understand about not wanting to wake a toddler! Just remember, even if we’re silent…we’re here! Your blog is so beautiful and sweet – – don't worry about the comments. I am a momma of five, all big now, and how I remember those days that are your reality. HEY MISSIE!!! Be easy on your self!! I love love love your blog it is one of my first that I started look at and one of my fav!! This is a Shout out for you, YOU are a Gem to work with and crazy skills!! I subscribe to your blog. The first thing that caught my eye was your banner, and the colors. They spoke to me! And your artwork is so lovely. But what really spoke to my heart were your references to scripture and your sweet spirit that comes across in your posts. The love of Jesus is all over your blog. Thank you for your kind and generous heart. God bless you! P.S. I always thought popular bloggers like you got tired of comments. I've seen bloggers who have over 300 comments sometimes and I think, I'm not going to overload them with my comment, they probably don't even read them. I guess I was happily wrong! Thank you for letting me comment! Such a sweet blog! Thank you for all the fun freebies. OMG I’m dying! I love pastel colors and these frames are so adorable! Thank you so much for sharing them to us! WOW!!! Just discovered these! Thank you so much. You are brilliant!